give a fig | Self. Conscious. The word SELF-CONSCIOUS landed in my head yesterday, and I took a moment to give it a think. I had a teensy revelation. Oxford D goes on to list synonyms that are discouraging downers: embarrassed, uncomfortable, uneasy, nervous, unnatural. Yet its choice of antonym for self-conscious shines with positivity: confident. The reason this term gave me pause is two-fold. One – back in the day, I always considered myself to be self-conscious. And, as the dictionary tells me, I didn’t consider this to be complimentary. My self-consciousness translated to discomfort in the spotlight, uncertainty, non-recognition of my unique brilliance, and an ever-present feeling that I didn’t quite fit in. That maybe I wasn’t good enough. Yet I somehow knew there existed some other place where I could shine my magic. Self-consciousness was like an anvil hanging around my neck. My new interpretation of self-conscious takes the term to a more deserving, even literal direction: I am more conscious of my self. I am more connected to who I am. I try to be present, to live in the moment. I have found my voice, and I have embraced me, with all my gifts and imperfections. I am worthy. I am more authentic now than ever before. Whew. Okay. Let’s take a right turn, and shift into some fine foodery! Here’s a cheeky segue: I am consciously connecting not only to self today, but to my food choices. I am paying attention to this amazing body of mine that asks for nutrient-dense sustenance to fuel its cells. It also asks for deliciousness. 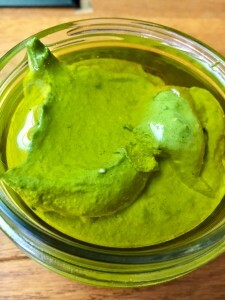 Thus, I deliver – a divinely luxurious pesto! 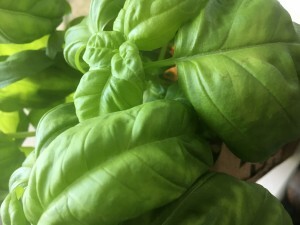 Made with a couple of fistfuls of this gorgeous fresh basil adorning my windowsill. Place everything in a high-powered blender, and whirl until creamy-smooth. Add more olive oil, if needed, until reach desired consistency. Season to taste. To store left-overs: spoon into a glass jar, and cover with a shallow layer of olive oil. Tightly cap and place in fridge.